Since 2002, Smart Phone Resource has been the company behind so many great forum communities for smartphone owners. Many of you might now us from the early Palm Treo days over at Everything Treo. Since then, we’ve launched a number of mobile focused communities, including the world’s first iPhone forum at everythingiCafe. Our communities are known for being well moderated, easy to use, ad-free and most importantly, filled with friendly, knowledgable people. With HP no longer making webOS devices, that leaves folks switching platforms, leaving for Windows Phone, Android or iOS. 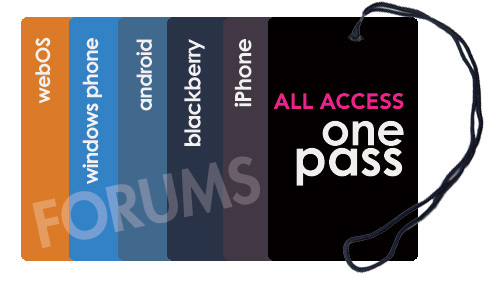 For this growing segment of our community, we are incredibly proud to introduce Forum One Pass – the all access forum pass. Using One, you can login to any of our communities using one username and password. So if you were a member of everythingpre, then you can turn on access to any of our communities by using your existing username and password when you first started your account with us. With Forum One Pass, you can easily jump from one forum to another, without the hassle of having to create new accounts. How does the One Pass works? If you are an existing member of any of our forums, you can login to any of our forums using the same username and password. If you join any of our forums, you’ll also enjoy access to One Pass. What forums can I access with One Pass? Will other forums be available through One Pass? At this point, we don’t have any plans to add additional forums. What if I don’t want to use the One Pass? Nothing changes. The One pass is only activated when you visit a participating forum. What information travels between forums when I use the One Pass? The only information that is shared is your username and password. Post counts, avatars and all ofter information is stored on a forum by forum basis. What if I am already a member of multiple forums? First off, thanks! To use One Pass, login to your accounts and make sure that your username, password and email accounts all match. If you need support with One Pass, please visit the Site Feedback and Help section in any of our forums for assistance. How much does One Pass cost? Our forums are completely free and ad-free for members. Is there a One Pass app? As of now, we are looking at providing One Pass applications for Android and iOS in 2013. Other platforms are also under consideration. We do welcome you to utilize our new mobile template, which will be available on all sites in the coming weeks. We currently offer platform specific apps. iPhone users can utilize the free everythingiCafe app, available in the App Store. Android users can find the free everything Android app, available in the Google Play Store. Can I opt out of One Pass? Forum One Pass is an opt-in only service, activated upon logging into one of our sites where you had not previously registered. If you don’t opt-in, there is no need to opt-out. If any time you’d like to leave one of our communities, please login and use the respective contact us form. I need help with One Pass? If you should need help, please post your question in the Site Feedback and Help section in any of our forums. We’re excited about One Pass. Excited about offering our members the ability to roam freely between our communities, finding the same ad-free and consistent user experience they’ve come to expect from Smart Phone Resource.